The Bike Alarm is a device that detects motion and if a possible theft is about to take place will sound a warning alarm. 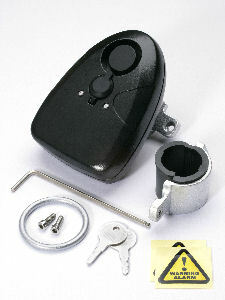 The alarm will continually sound if the theft continues. Battery supplied, armed and disarmed using a key, universal fixing allows to be mounted on all types of bike, discreet black cover.